Siren cam. A wailing police car takes a wild joyride, traversing the limits of both space and time and blaring its way through soggy streets and sidewalks, an upper class home, a woman’s locker room, and even a quick car wash. The typefaces, chosen and laid out by title designer Douy Swofford, are Stencil (for the title) and Antique Olive (for the credits). 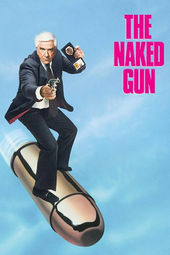 By now they are iconic, immediately recognizable as part of the brand of the Naked Gun franchise. As the sequence finishes, the siren screaming its way down a rollercoaster, by now a disembodied character in its own right, we know exactly what to expect from the following film: a hilarious ride of unreal proportions.